As the proud owner of a new puppy, I have been bombarded with worries and concerns about my new furry friend. I’ve done my best to find the most tasty food, teach her the right places to potty, and redirect her chewing to appropriate toys (Emma’s favorites are the Busy Buddy Twist n’ Treat and the new PetSafe Busy Buddy Nobbly Nubbly. The other thing I have worried about is whether or not she would develop separation anxiety. I figured this was the most common behavior problem in puppies and, as hard as it is for me to be away from her, I’ve been splitting our days with her at work with me half the day and at home the other half to try to prevent it. I always wait outside the door to see what she does when I leave and I usually only hear a few of her sweet little barks before she amuses herself with something else. As I thought about Emma on my drive back to work after lunch, I decided to talk with one of our fantastic trainers Michelle Mullins, CPDT-KA about what the most common reason for behavior problems really was and, to my surprise, it really wasn’t separation anxiety. I asked her if separation anxiety was still as widespread as some pet owners, like me, assumed. Her response? Not exactly. Michelle told me many dogs do suffer anxiety due to being apart from something or someone they are attached to, but the behaviors that go along with the distress (barking, howling, attempting to escape confinement, destruction and inappropriate elimination) also have other causes including not enough exercise, excitement, reactivity to noise, play, illness, etc. 1. 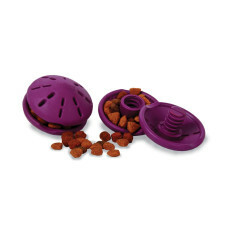 If you have to be away during the day, keep your dog entertained with food dispensing and chew toys. They can be hidden in different spots around your home for your dog to find all day long. 2. Consider enrolling your dog in Doggie Day Care. Make sure your dog enjoys playing with other dogs and take the time to really evaluate the facility’s staff. 3. Take your dog on a vigorous morning walk. This can really promote downtime during the day for most dogs. You can also employ a professional dog walker to come in while you are away. 4. Evaluate the consistency and frequency of your training. Ten or fifteen minutes a day can make for a well-mannered pooch. 5. Be proactive. Train your dog to do the behaviors that you like. If she knows several “good” behaviors like sit, down, stay and come, she is more likely to choose the appropriate way to behave. What is the biggest training issue you face? How do you help your pet spend her energy so she can practice her good behaviors? ABOUT NATALIE As the PetSafe Brand Marketing Specialist, Natalie manages The Paw Print blog and generates other brand related content including public relations and promotions. Before PetSafe, Natalie worked in the local media covering politics, education, and religion. Natalie’s puppy, Emma, spends almost as much time in the office as she does.